Back in Tideswell, I made a return visit to Tindall’s Bakery for more local treats. There, I discovered handmade Thar Cakes, Wakes Cakes and Derby Biscuits. These cookies were a random find, but they were so delicious and came with a local and historical background – so they deserved their own post. Tideswell village is famous for their Wakes Week celebrations and their Wakes Cakes – called cakes, but are not cakes. These cookies are a wheat flour based biscuit made with egg and currants, and topped with granulated sugar. From what I gather, Tindall’s Bakery is known to offer the best in Derbyshire. According to the printed description taped above the display, these particular treats are baked specifically for Wakes Week – a week long festival which, over the years, has become the main summer holiday for local villages of Derbyshire. This tradition dates back 750 years, and began as a celebration of the Saint’s day pertaining to the village church. In Tideswell, Wakes Week begins in late June, or the first Saturday closest to St. John the Baptist’s day; to whom Tideswell’s church is dedicated. Enough history. Back to the treats: Also pictured are three Derby Biscuits. 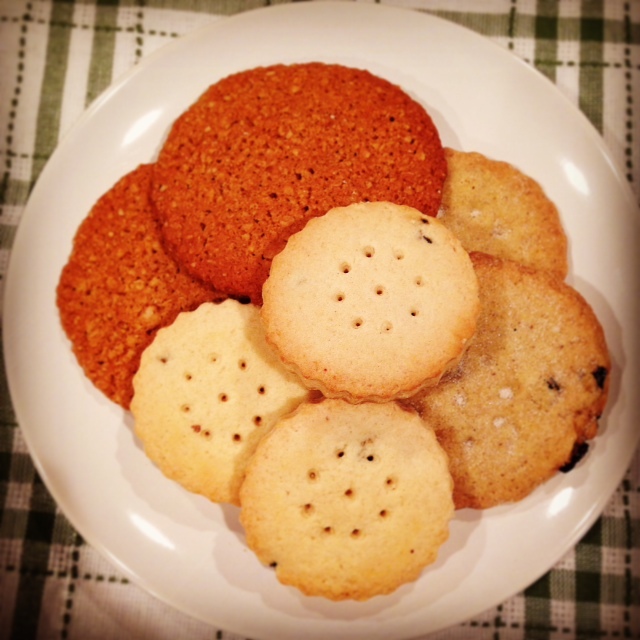 Round crimped edged shortbread cookies with a special Tindall’s touch of rosewater and coriander. Perfect for tea time – as Tindall’s had displayed in their tea-time focused window. My favorite, out of the three I tasted, were the Thar Cakes. These cookies (again, not a cake) is an old Derbyshire tradition, made with oats and lots of ginger. They are typically baked in the form of a cake or loaf, but Tindall’s offers their version as a round, thin and moist cookie. I absolutely love ginger so, these cookies automatically won my heart.